Lock in a great price for Intercontinental Cairo Citystars – rated 8.2 by recent guests! I like the location and the hotel is connected to the shopping mall and close the airport. 1- Location. 2- Attached to a big mall. 3- Nice restaurants. Great place, great rooms and great location. Very good stay for a business trip. I really thank Mr Ahmad at the Members Reception and the rest of the team for their great service and help to make my stay smooth and less hectic. They shown great professionalism and friendliness. Definitely I’ll choose this hotel for my next trip to Cairo. The reception staff not friendly and rejects my booking reservation for sally reasons. Intercontinental Cairo Citystars This rating is a reflection of how the property compares to the industry standard when it comes to price, facilities and services available. It's based on a self-evaluation by the property. Use this rating to help choose your stay! One of our top picks in Cairo.Located next to Citystars shopping mall, this luxury hotel has large outdoor swimming pool and 10 varied restaurants. Intercontinental Cairo Citystars’ spacious rooms offer luxury furnishings and LCD TVs with more than 150 satellite channels. Allergy-free rooms are available on request. The Lifestyles Health Club and Spa has a hydro pool, massage treatments, sauna and steam bath. Daily aerobics classes are available at the gym. Guests above 16 years old can enjoy Health Club facilities. InterContinental Cairo Citystars offers various dining options such as the Japanese cuisine at Shogun restaurant, Lebanese delicacies at Fayruz restaurant, traditional Italian cuisine at Maestro restaurant and authentic Egyptian cuisine at Al Khal restaurant. You can also enjoy your favorite cocktail at Bellini Cocktail Lounge or The Lounge overlooking the pool. InterContinental Cairo Citystars offers complimentary WiFi and 23 meeting rooms with latest technology. The hotel is 10-minute drive away from Cairo International Airport. Nasr City is a great choice for travelers interested in friendly locals, entertainment and tourist attractions. When would you like to stay at Intercontinental Cairo Citystars? This air-conditioned Standard Double Room features free WiFi, a seating area, a flat-screen TV, a work desk, an electric kettle and iron with ironing facilities. The bathroom is fitted with a bath and shower and offers free toiletries, bathrobes, slippers and a hairdryer. Private parking is available on site (reservation is not needed) and costs USD 10 per day. This air-conditioned Club InterContinental King Room features free WiFi, a seating area, a flat-screen TV, a work desk, an electric kettle and iron with ironing facilities. The bathroom is fitted with a bath and shower and offers free toiletries, bathrobes, slippers and a hairdryer. - Buffet breakfast from 7 am to 11 am. - Afternoon tea from 4 pm to 6 pm. - Happy hour from 7 pm to 9 pm. - A wide selection of DVDs and international publications as well as board games. - Business facilities including photocopying, printing, local fax and wireless internet. - In case you are accompanied with children below the age of 12 years, you are welcome to enjoy your breakfast in Esplanade restaurant, and both the afternoon tea and the happy hour at our family lounge in the 12th floor on complimentary basis between 16:00 and 21:00. This air-conditioned Executive Suite features free WiFi, a seating area, a flat-screen TV, a work desk, an electric kettle and iron with ironing facilities. The bathroom is fitted with a bath and shower and offers free toiletries, bathrobes, slippers and a hairdryer. This air-conditioned Standard King Room features free WiFi, a seating area, a flat-screen TV, a work desk, an electric kettle and iron with ironing facilities. The bathroom is fitted with a bath and shower and offers free toiletries, bathrobes, slippers and a hairdryer. This air-conditioned Two-Bedroom Suite features free WiFi, a seating area, a dining area, a flat-screen TV, a work desk, an electric kettle and iron with ironing facilities. Other facilities include a kitchen fully equipped with an oven, microwave and kitchenware. The bathroom is fitted with a bath and shower and offers free toiletries, bathrobes, slippers and a hairdryer. This air-conditioned Superior King Room features free WiFi, a seating area, a flat-screen TV, a work desk, an electric kettle and iron with ironing facilities. The bathroom is fitted with a bath and shower and offers free toiletries, bathrobes, slippers and a hairdryer. This air-conditioned Club InterContinental Room features free WiFi, a seating area, a flat-screen TV, a work desk, an electric kettle and iron with ironing facilities. The bathroom is fitted with a bath and shower and offers free toiletries, bathrobes, slippers and a hairdryer. This air-conditioned One-Bedroom Residence Suite features free WiFi, a seating area, a dining area, a flat-screen TV, a work desk, an electric kettle and iron with ironing facilities. Other facilities include a kitchen fully equipped with an oven, microwave and kitchenware. The bathroom is fitted with a bath and shower and offers free toiletries, bathrobes, slippers and a hairdryer. This air-conditioned Club InterContinental Deluxe Room features free WiFi, a seating area, a flat-screen TV, a work desk, an electric kettle and iron with ironing facilities. The bathroom is fitted with a bath and shower and offers free toiletries, bathrobes, slippers and a hairdryer. InterContinental Cairo Citystars is one of more than 4500 Hotels around the World under the umbrella of InterContinental Hotels Group. Our Hotel is located in a complex that has three hotels: InterContinental, Holiday Inn and Staybridge Suites. 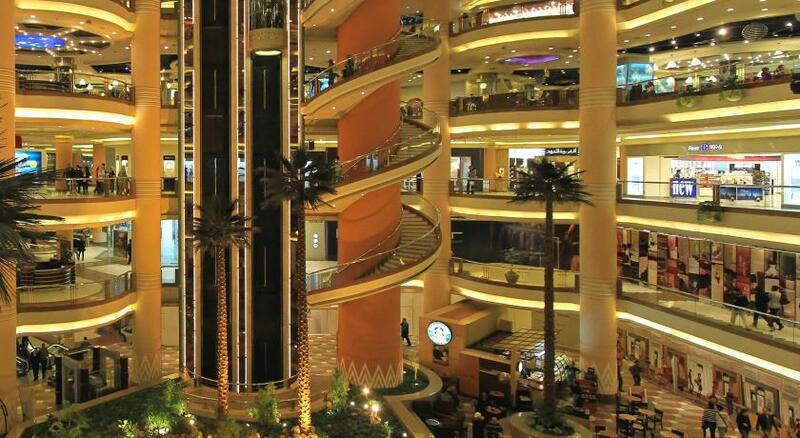 Located in the complex is the Citystars Mall that has more than 650 shops that accommodate all tastes. A direct access from the Hotel to the mall is available to our guests as well. Hotel surroundings – This neighborhood is a great choice for travelers interested in friendly locals, entertainment and tourist attractions – Check location Great location - show map Guests loved walking around the neighborhood! House Rules Intercontinental Cairo Citystars takes special requests – add in the next step! All children under 16 years are charged USD 30 per night for extra beds. Any additional older children or adults are charged USD 30 per night for extra beds. Intercontinental Cairo Citystars accepts these cards and reserves the right to temporarily hold an amount prior to arrival. The main restaurant (breakfast and dinner on one day) is chaotically disorganised, there is a real need for leadership from the restaurant manager(s). Most days we had to ask 3 or 4 times for coffee before it arrived. The egg station (omelletes, etc) was a severy bottleneck and eggs were not offered at any other part of the servery. We stood in line for so long trying to get omelletes that when we got back to our table the coffee, fruit juice that we had already collected had been cleared away in preparation to offer the table to another guest! Every breakfast was the same level of chaos. Dinner was only slightly better. On one day we lost Internet access for 4 hours, very inconvenient (connected to Wifi but internet down). People smoking even in the forbidden areas including the lobby. The staff is very supportive and trying their best to ensure guest comforts. Special thank to Mr. Muhab from reception team for his effort. The check in and check out take longer than the expected.the food supply at breakfast not followed up well when any item finishes.